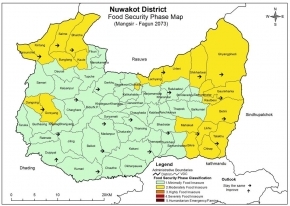 All 61 vdcs and 1 municipality of the district are Minimally Food Insecure (Phase 1). HHs have food stock sufficient for more than 4 months due to harvest of maize, potato and previous stock of early paddy. Major markets are functioning well with sufficient food stock; income from sale of agri./livestock products and wage opportunities in agricultural works.